Six Silent Auctions, Ending Soon! 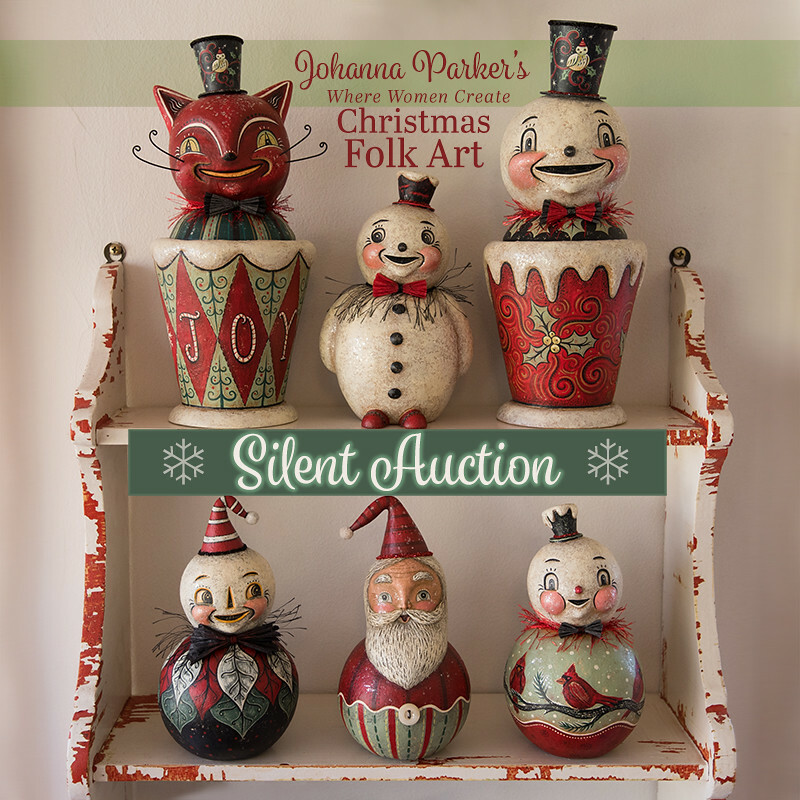 Don't miss the 6 Silent Auctions on our Website featuring a selection of my collectible folk art originals, all appearing in the current issue of Where Women Create Magazine! Best Offers for each piece are being accepted until the auctions end on December 13th. Visit our Silent Auction page for a medley of photos and details about each piece as well as magazine snapshots of each character. ALL Bids are welcome, so don’t be shy! Jump on in with a bid so that we can update you with the latest best offer before the auction ends. THANK YOU for your interest and support! Best Wishes & Good Luck! Hey All! 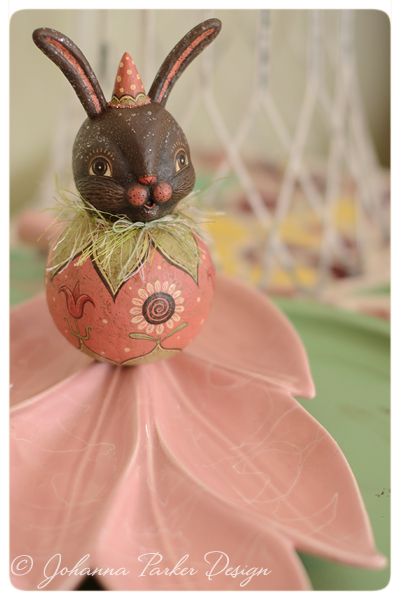 Hop on over to our NEW BLOG on our NEW Website for a medley of clickable photos from this year's 3rd Annual Glens Art Walk! It's a Halloween feast for the eyes :) Enjoy! 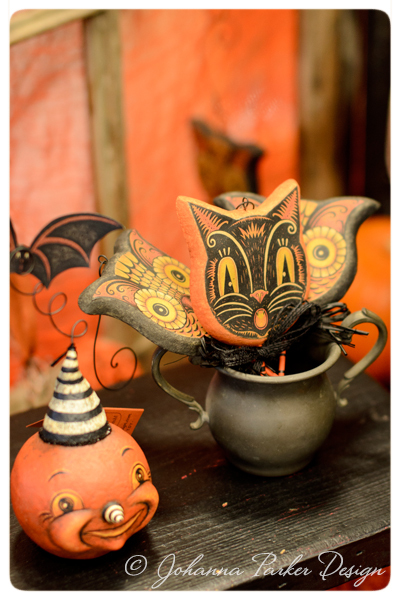 Collector Candy Bowls for Halloween! * * * * * * * * Pre-Order by April 15th! For more Details, visit my Website! 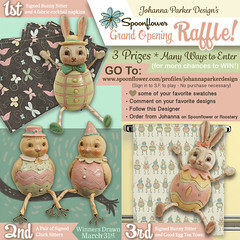 Spring Giveaway Raffle * 3 Prizes! - Order fabric, wallpaper or gift wrap from my Spoonflower Shop, and/or hop on over to the Roostery by clicking on the pillow icon underneath each swatch and order one of my many products, made & ready to enjoy! Spoonflower's notifications will alert me when you interact in my Shop. So, I'll be able to track my supporters & count your entries. 3 Winners will be drawn on March 31st! Hello Dear friends & Happy New Year ~ I know, I know... it's already February!! That said, I'm popping in for a quick post and update. 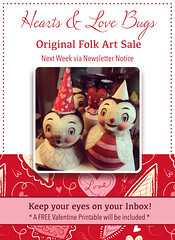 Next week, I will be releasing a handful of original Hearts & Love Bug folk art characters via Newsletter notice. Included will be a free Valentine Printable, so if you haven't done so, please Join my Mailing List. This will be my first V-Day collection, donning the traditional red and pink palette. I look forward to sharing them with you! Also, many thanks to those that adopted last month's medley of New Year's Snowmen! What FUN! Fa La La my friends! Another festive round of Vintage Holiday delights is here! 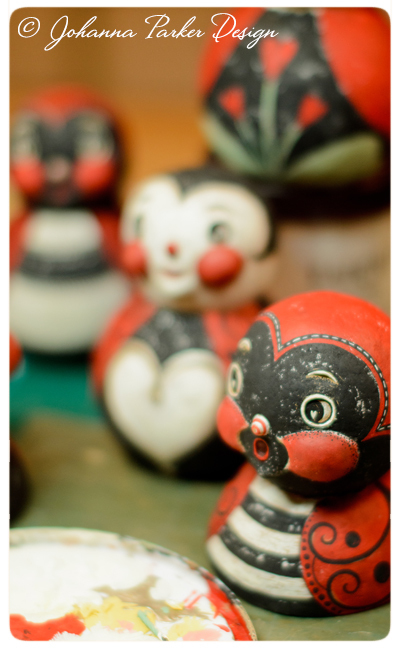 Thanks to all for joining me for last month's Vintage Holiday Blog sale. I did a little treasure hunting and have decided to release a few more limited edition goods that I have on hand. I am adding a couple new lit box signs that plug and GLOW. Although fleeting, I was fortunate enough to get my hands on an assortment of samples from this screen printed Vintage Holiday collection of reproductions, so this is your chance to collect a few rare pieces, each signed. Please review the descriptions below each image for more information, and click on the photos for a larger view. To reserve your faves please EMAIL ME and include the name of the set or single you wish to adopt! Also include your name, phone number and shipping address. When your order is prepared, we will send you an e-invoice to complete the sale. Thank you for interest in my collectible holiday licensed designs! in a soft, frosty blue/green hue! Cards include an illustrated full color scene on the inside too! Ho Ho Ho: "Wishing you a jolly holiday!" 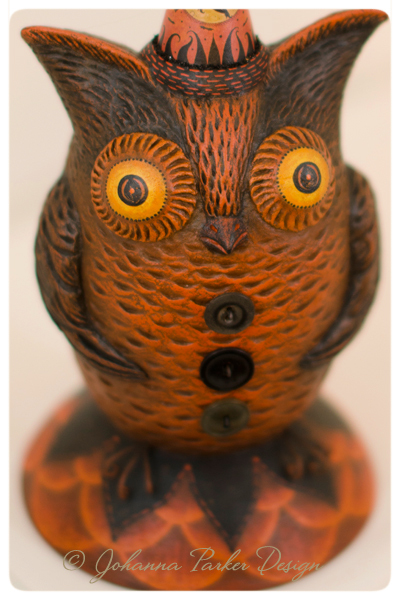 Happy Owlidays: "Hope your holiday is a hoot!" 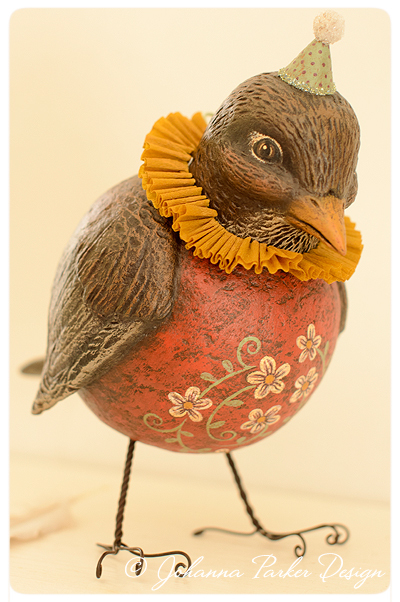 Jolly Be: "Frolic and glide along the ride!" Warm Wishes: "May your den be cozy & bright!" ~ Ornament & Box Signs, Signed by the Artist ~ 1 Set Left! * Take a quick video tour of the Inside & Out of each Greeting Card design! ~ All Signed by the Artist ~ SOLD OUT! ~ Signed by the Artist ~ SOLD OUT! in a frosty blue/green hue! ~ Each Signed by the Artist ~ SOLD OUT! * Battery operated LED lights allow wreath berries to GLOW! ~ Box Sign & Santa, both Signed ~ SOLD OUT! SAVE the DATE! 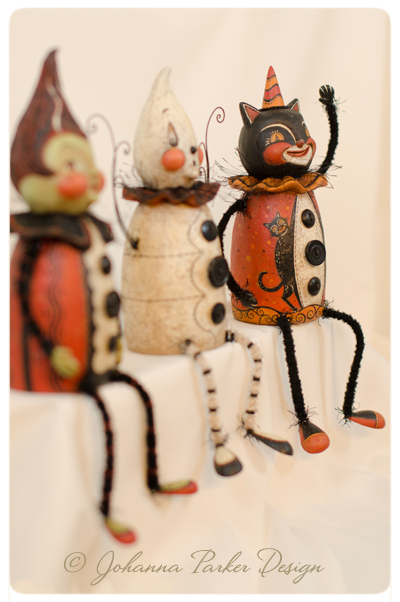 In just one week, I will be debuting my 2016 collection of wintery original characters on my website. 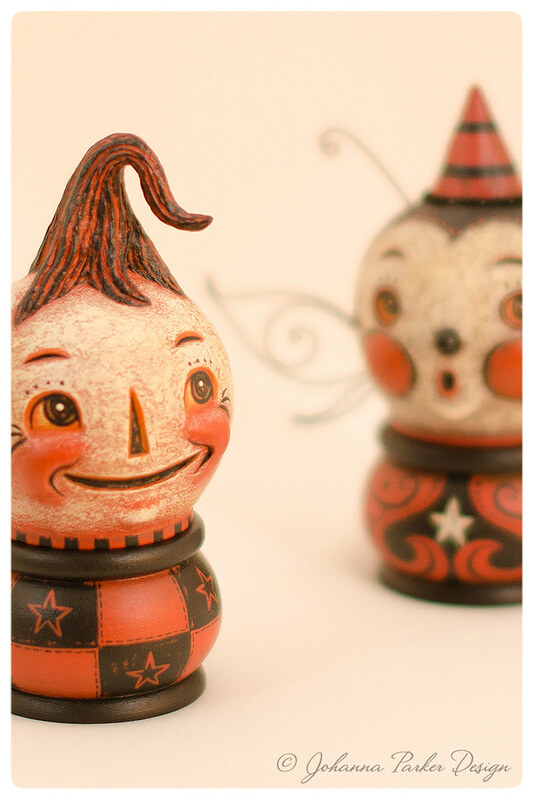 On the evening of Wednesday December 14th, I will be sharing a festive mix are bell ornaments, snowmen, penguins, Santas, and other fun folk art characters. If you haven't done so, please join my Mailing List for the start time and details. Follow me on Instagram & Facebook for sneak peeks along the way! Here we go again!.... 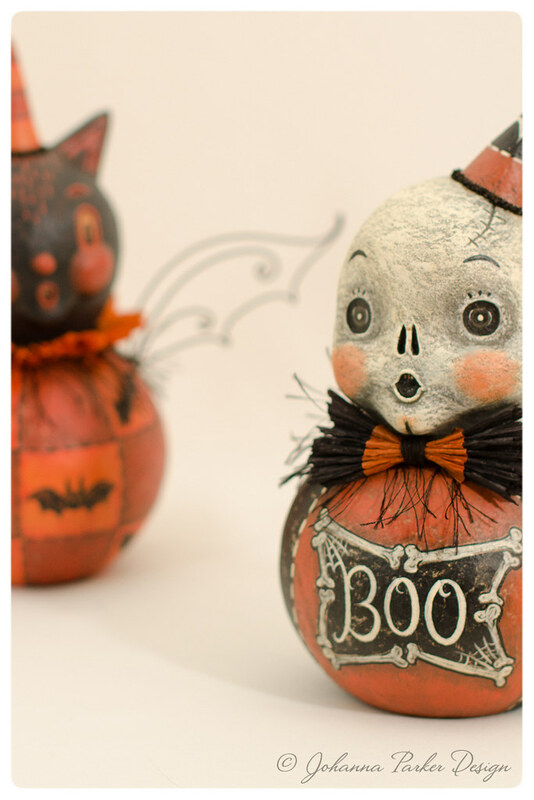 HAPPY HALLOWEEN dear collector friends! :) Please scroll down to see the last of of my signed reproduction delights that I am offering this season. Some characters cross over to other sets, so make sure you peek at each image before selecting your fave. Please EMAIL ME with the name of the set or single you are interested in. We will be preparing your orders and sending out e-invoices after your package has been weighed and measured for a shipping estimate. Boxes will begin to ship out next week! - 1 Jack Box from Johanna's Transpac line. - 1 Glass candy jar with jack /cork lid from Johanna's Transpac line. CLICK image for a larger View! Johanna's 2016 line of Bethany Lowe Designs. 2016 line of Bethany Lowe Designs. 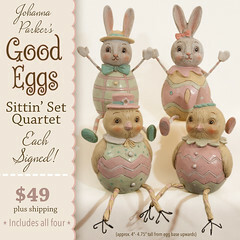 from Johanna's new "Punkin Peep" Transpac line. 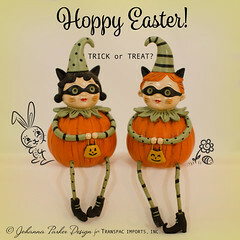 - 1 Jack Sitter from Johanna's new "Punkin Peep" Transpac line. 2014 line of Bethany Lowe Designs. then the product was discontinued. These were samples. 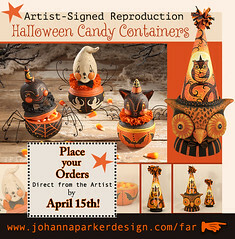 Collector Candy Bowls for Halloween ************* Pre-Order by March 15th! 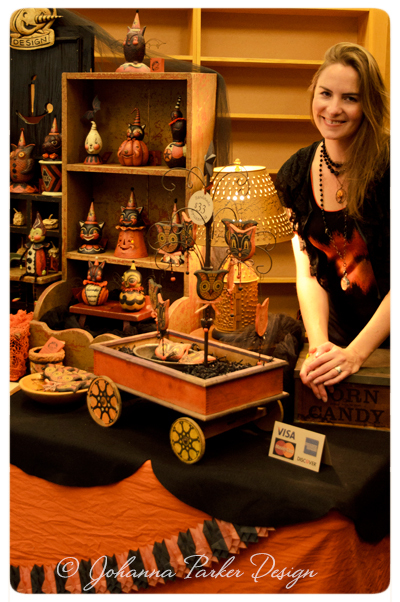 * See more at my Folk Art Reproductions page..
* That's me smiling big before the start of the show! 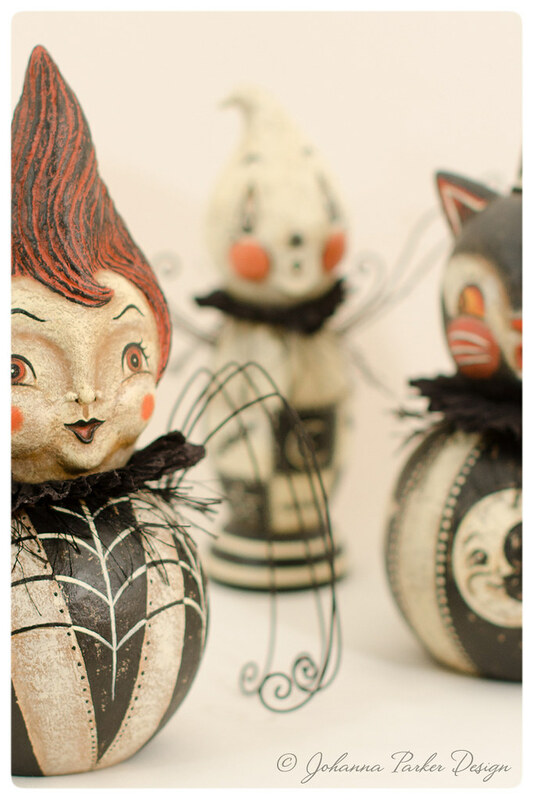 * Here's another peek at my Halloween folk art originals, perched and waiting to meet and greet! * That's me and mom all decked out for Halloween! 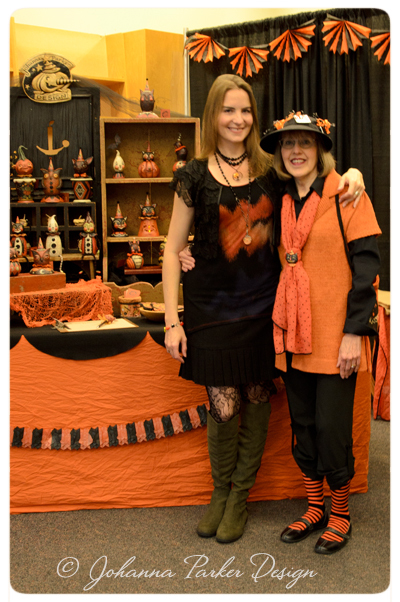 She was truly donning the orange and black from head to toe! After all, she's my Halloween Mommy as I was born on October 31st! * JP sneaks a peek from behind the spooky window! * More Halloween characters brought smiles and delight! 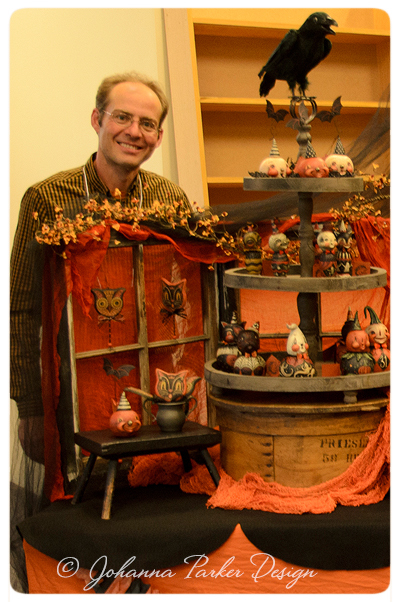 * Here's one of two collages, depicting fellow Halloween artists and their creations... I sure hope I captured everyone! * Lastly, here's a peek from Friday night after we set-up! Mom & Dad, living just minutes away, came to help! HAPPY HALLOWEEN to all of YOU! My oh My! My last blog post was 3 months ago! I guess it's about time I popped in for an update. 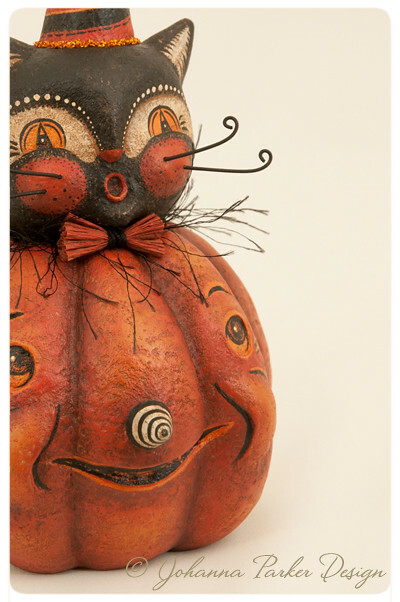 It's evident that scheduling 2 Halloween art shows this year has kept me rather busy!! I think I spent my whole summer, crafting in the workshop! 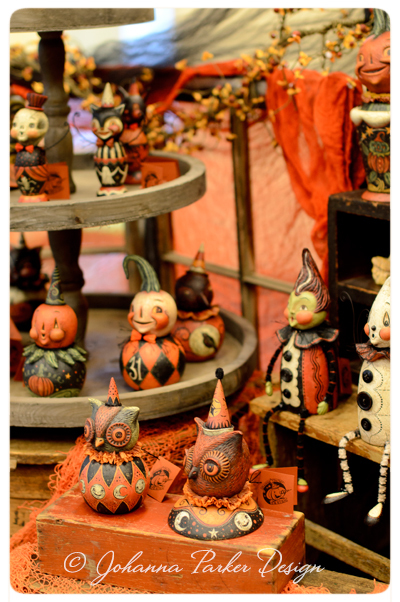 Now that September is here, the Hallowbaloo Show in Redmond, Washington is just around the corner.... 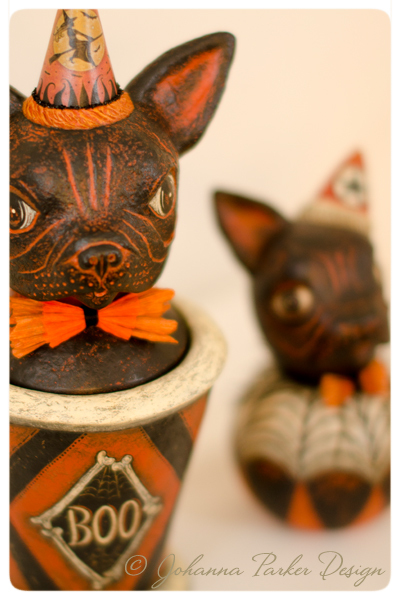 I have been adding the final touches to this special collection and photographing them as I go. Although I have a few more to finish up, I thought I'd share a sneak peek-a-boo at some of these unique guys. 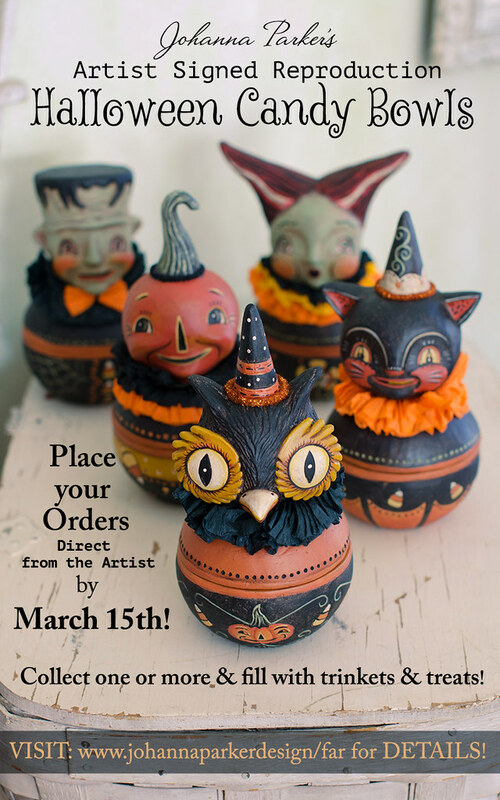 I am taking over 30 one of a kind Halloween folk art sculptures as well as some handmade ornaments featuring my pressed paper illustrated designs. 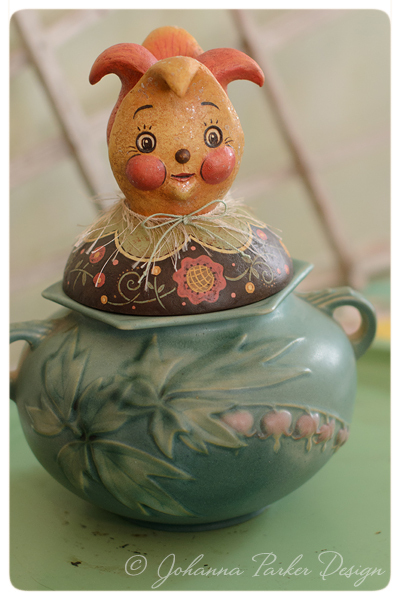 With my parent's house so close to the show, I will have my pick of some of mom's antique treasures to help prop my table and add interest to my display! (Thanks Mom!) So for now, I am focused on completing this collection and preparing for the journey. I look forward to seeing old friends, meeting online friends (finally in person) and making new friends too! See you soon!!! 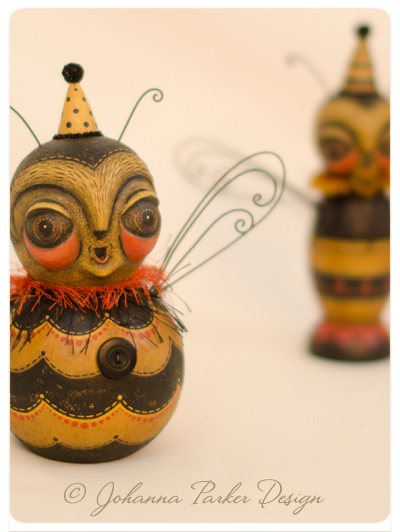 * Bees can Bee for Halloween too! * We've got a few sitters, just sittin' around! 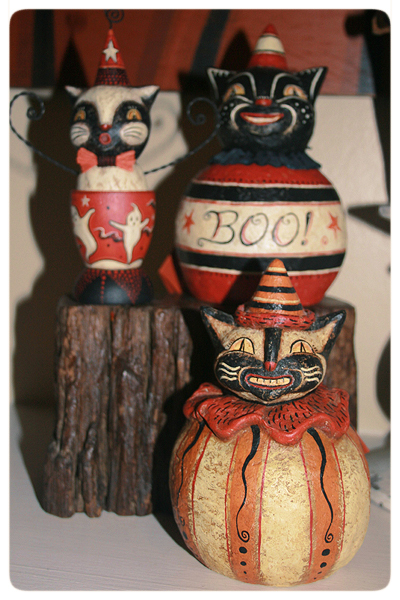 * This Halloween carnival cat can balance! 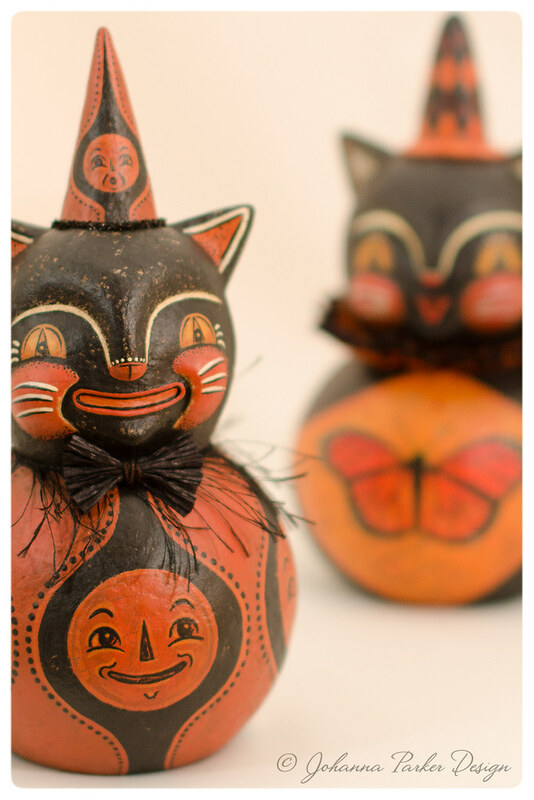 * Two black cats grin with illustrated hats. "Happy Frank" in the foreground is my first "Folk Lantern!" I had visions of making an entire family of these folk lantern characters. But, after realizing how much time it took to create this concept, I only made two. 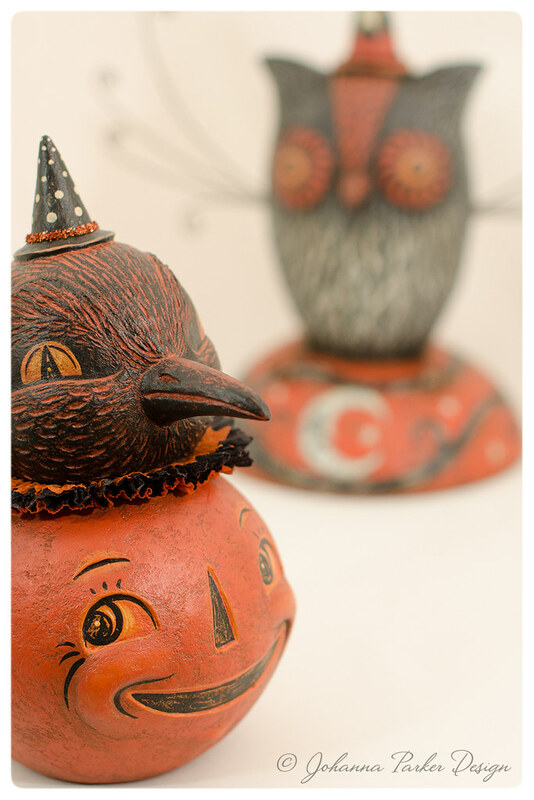 An owl folk lantern counterpart will be headed to Denver's Halloween Trunk Show in October. (He still needs paint!) WISH me LUCK! I hope to see you at one of my Halloween Shows this season! 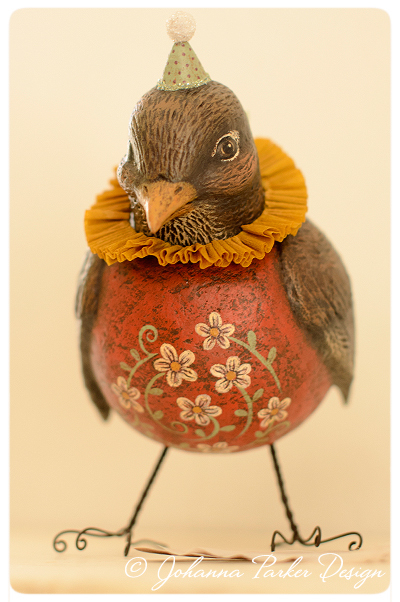 I love Robins! 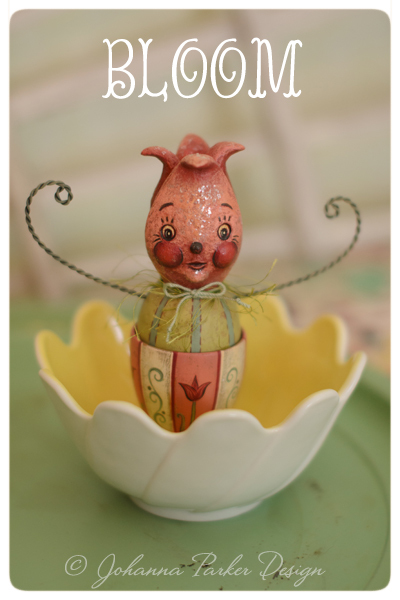 These animated characters usher in spring, and always make me smile! 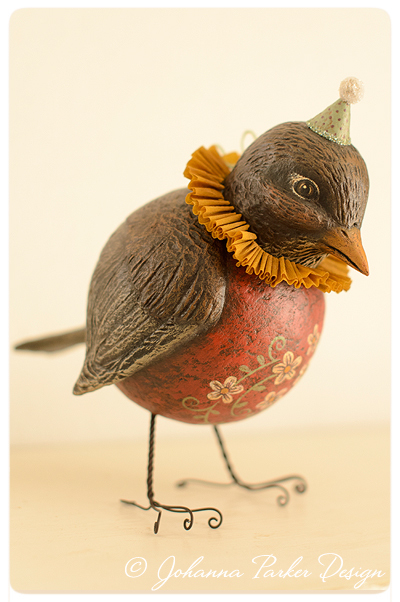 In honor of these dear creatures, I was inspired to create my very first robin! I'm partial to this piece, and as it is difficult to place a value on him, I have decided to leave that up to you. 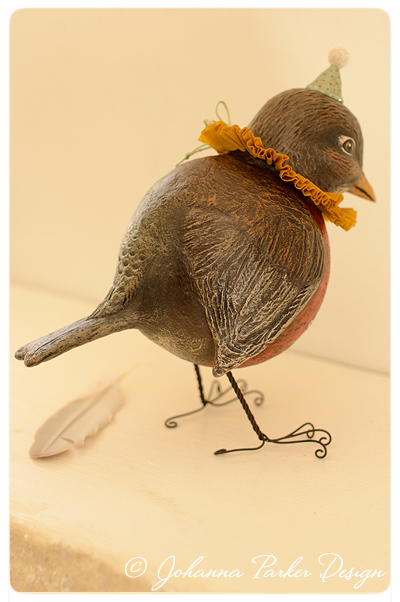 If you are interested in this one of a kind robin, please EMAIL ME with your Best Offer. I will be accepting your bids through Thursday this week. On the morning of Thursday April 2nd, I will notify all bidders via email of the highest bid along with the option to place another offer. The winning bid will be determined that evening by 8pm EST on April 2nd, and the winner will be notified via email. I appreciate your bids of affection and support! HAPPY SPRING! P.S. : Those who follow me on social media or read my occasional entries on my Scoop page will know that I am hosting a Spring Web Sale of originals soon! Tomorrow, Monday March 30th is the official date. Please Join my Mailing List to stay in the loop. I will have just a handful of one of a kinds up for adoption. 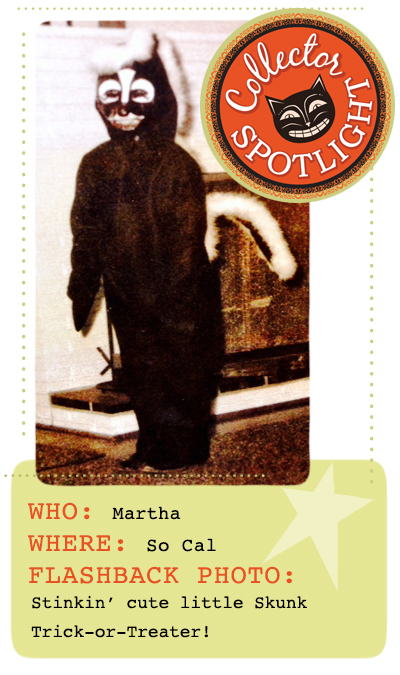 Well, the pleasure is all mine to post the Part 2 portion of Martha's Collector Spotlight! 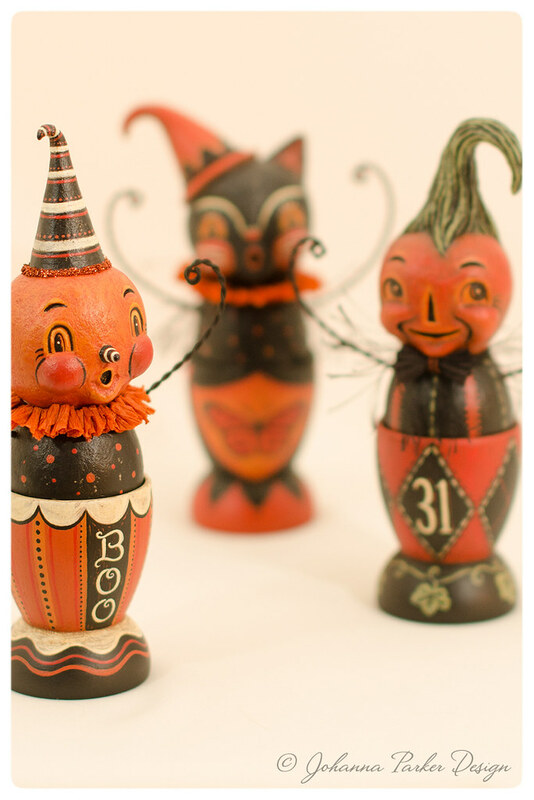 As a follow-up to last year's holiday feature, we are sharing with you Martha's Halloween folk art collection. 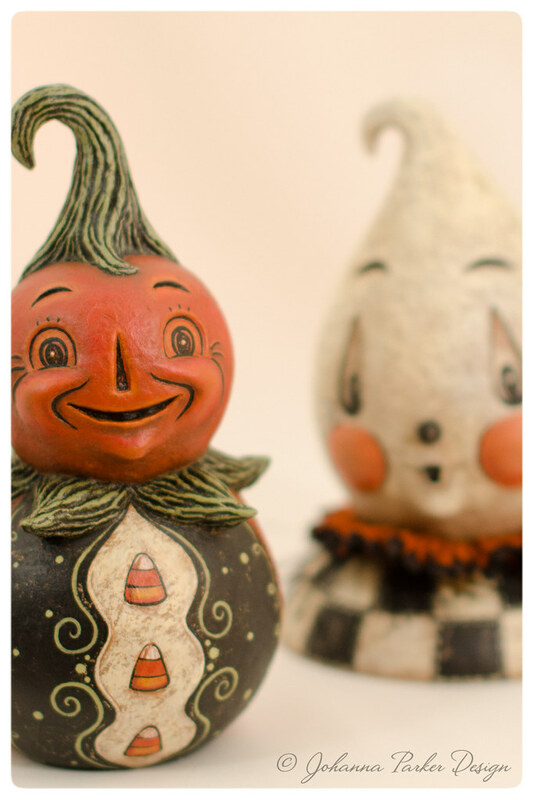 This season, she has graciously taken some stunning photos around her home, sharing peeks at how she decorates with the Halloween originals that she collects. And, I hear that he son Connor, had a hand in the photo-taking fun! Together, they took existing photos, and then played with alternative arrangements to offer additional decorating ideas for you! I am honored to see so many of my one of a kind characters, gracing this lovely home and treasured by the family that dwells here. 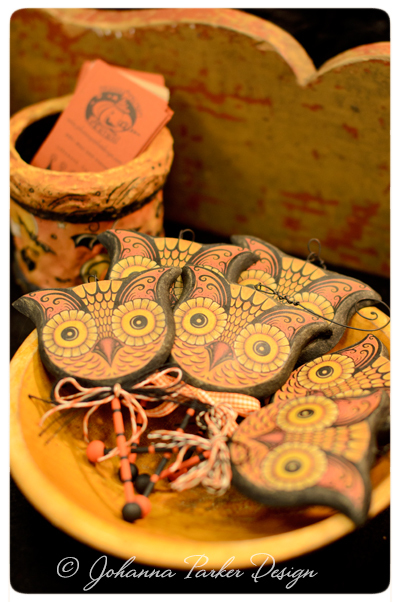 It is touching to see handmade art being appreciated and loved in this way. 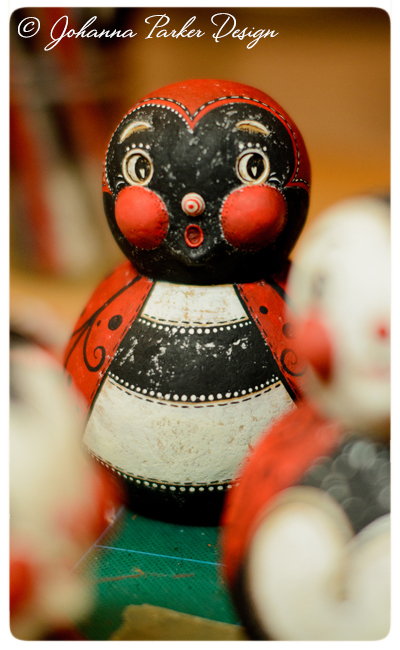 Martha collects from a variety of folk artists, and you will some of those handmade works in her photos shared. 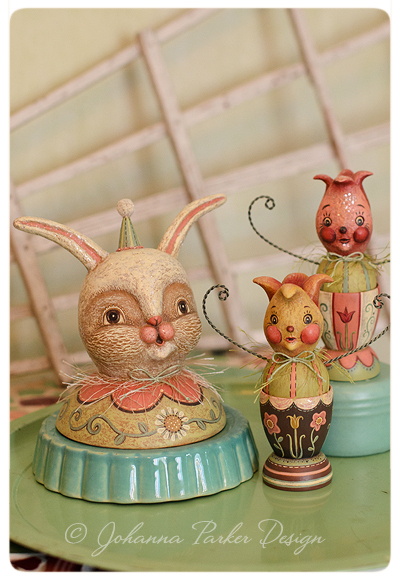 I want to extend my hearty thanks to Martha for sharing her home in two, lovely Collector Spotlight features! What a treat! 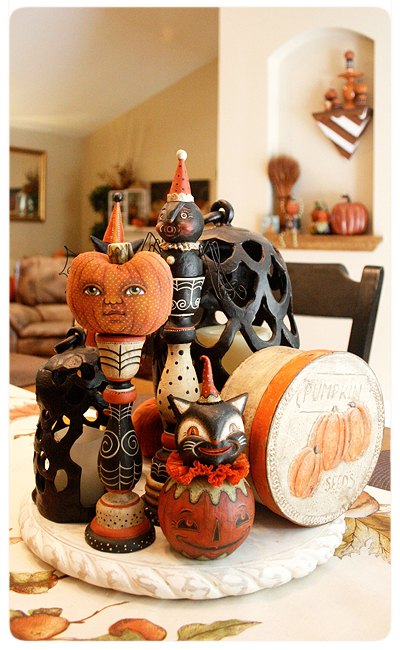 So, let's begin with an Artist & Collector Q&A that will meander throughout this Halloween post. Enjoy! 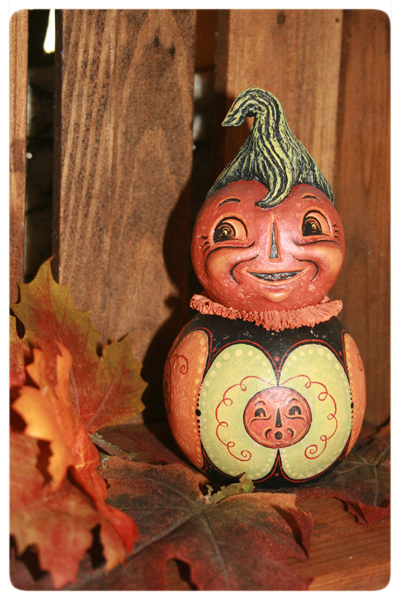 J: How did you learn about my Halloween folk art? Martha: I was sitting at my dining room table on my computer. 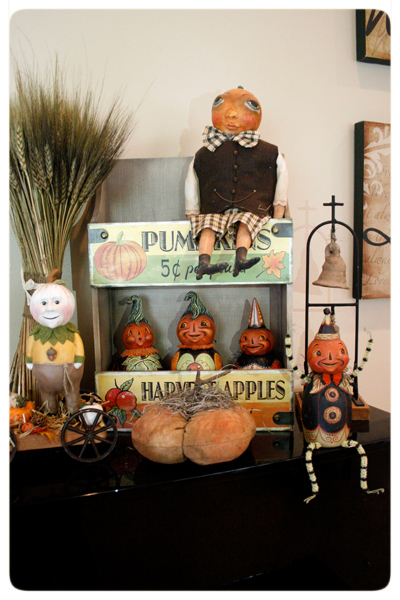 I have always loved decorating, for all seasons and holidays. 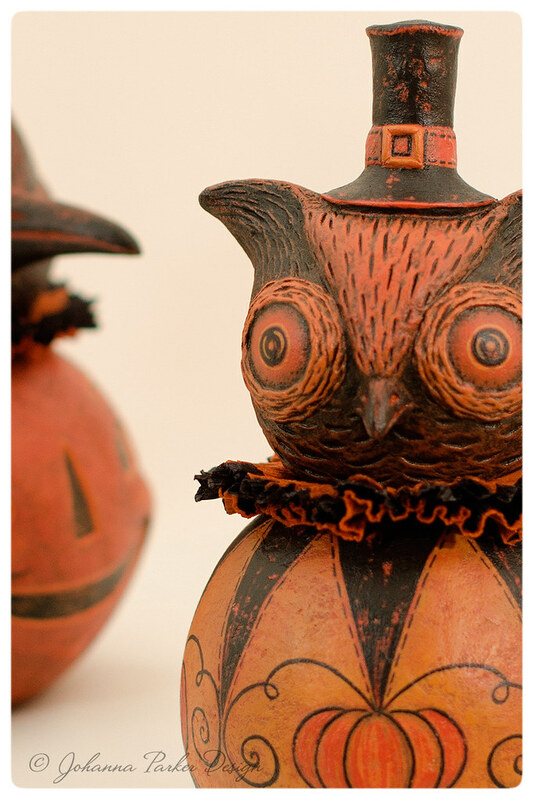 I was web surfing (this was before Etsy, Pinterest, etc) and I think I typed in Halloween folk art and found you! I'm trying to remember if you were having a web sale at the time, or not but I know that I bought my first piece then! I think that was 2006??? J: Yes, and I'm also thinking that maybe my feature in Better Homes & Gardens, way back when, could have led you my way as well. Whatever the magic was, we made the connection! * Speaking of the dining room table, I really love this tabletop centerpiece! 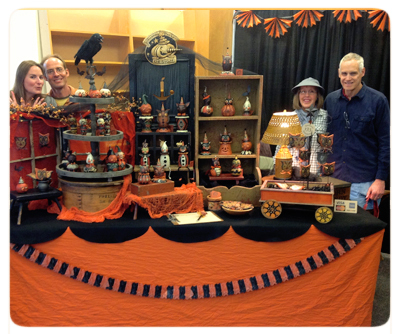 A decorative lazy-susan serves as a rotating display wheel for a grouping of Halloween delights. 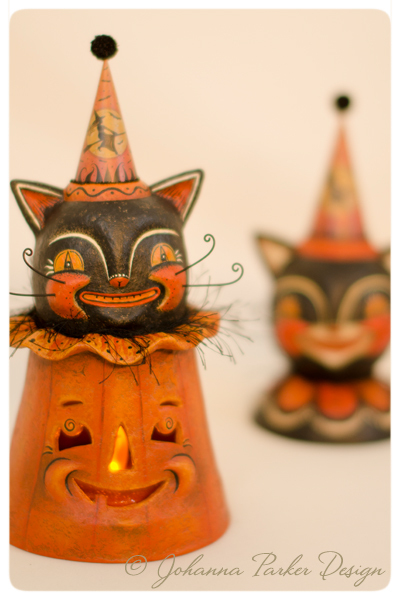 Included in the mix is a Halloween cat ball character original and a reproduction spider candle stick by Johanna Parker Design along with a sweet faced pumpkin by Jo James of Cart Before the Horse. Off in the distance, we see other seasonal vignettes that we will explore more along the way! *And if we give that wheel a spin, more Halloween characters emerge! 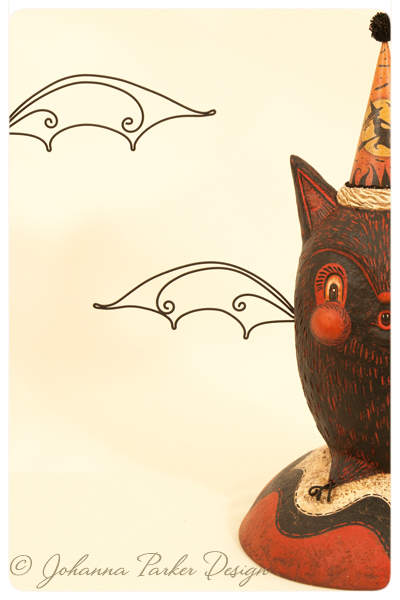 A spooky wire-winged bat with a #31 on his belly is an original by Johanna Parker Design. 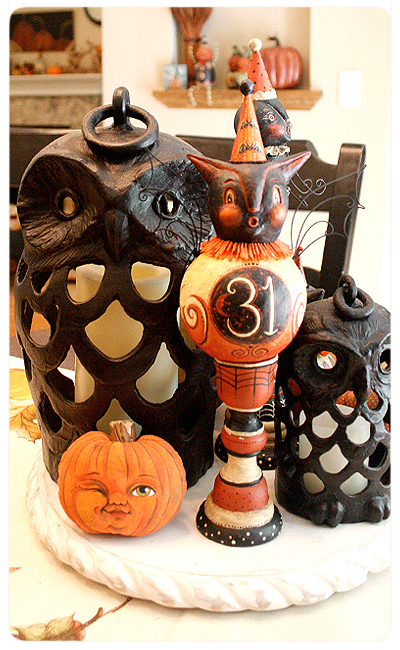 The pair of metal owls are from Pottery Barn and the winking jack-o'-lantern is another sweet piece from Jo James of Cart Before the Horse. * Martha shares a closer look at a festive coffee table display! 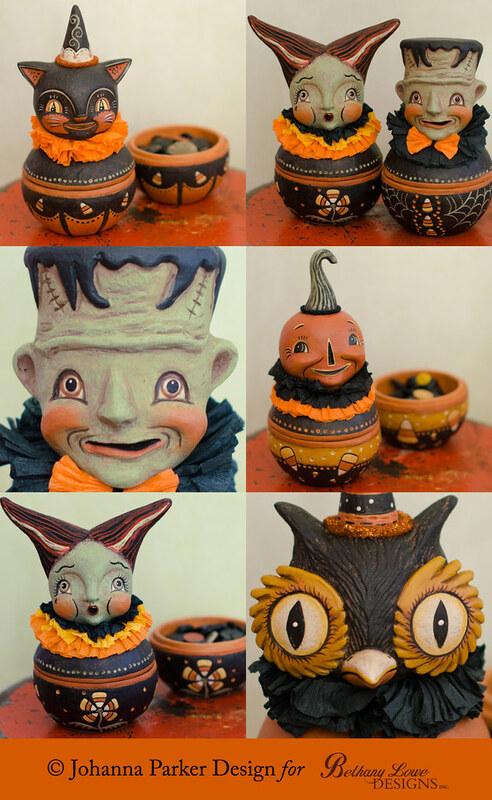 A collection of grinning jack-o'-lanterns by Tammy Strum of Light and Shadow Studio, nest in a leaf-filled primitive dough bowl. 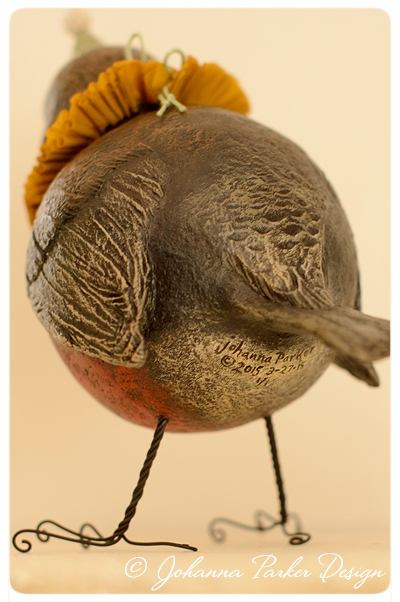 Above, a crate makes a rustic roost for an original moon man sitter by Johanna Parker Design. A beautiful bundle of wheat offers a harvest touch. 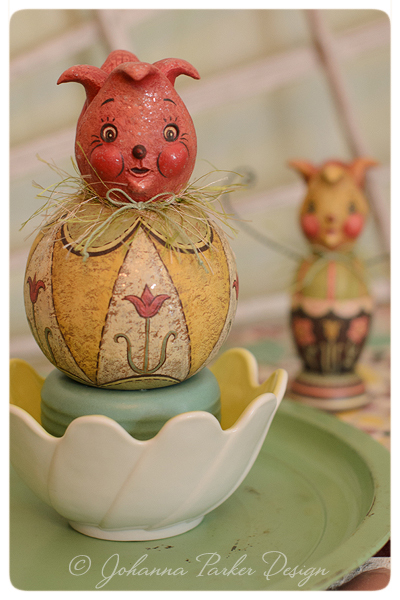 * A ladder-style shelf offers a high perch to group Martha's collection of my Egg & Kettle Cup characters. 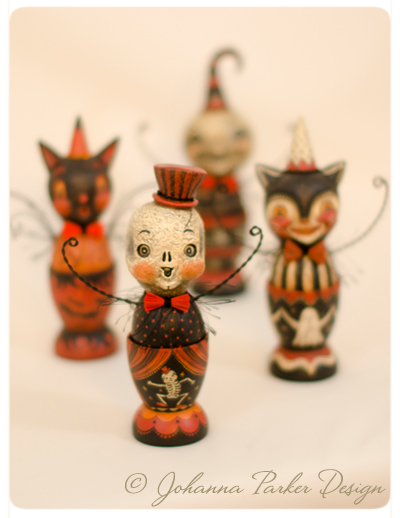 A ghost, bat, skelly and cats make for a fun family of little ones, lined up to delight! 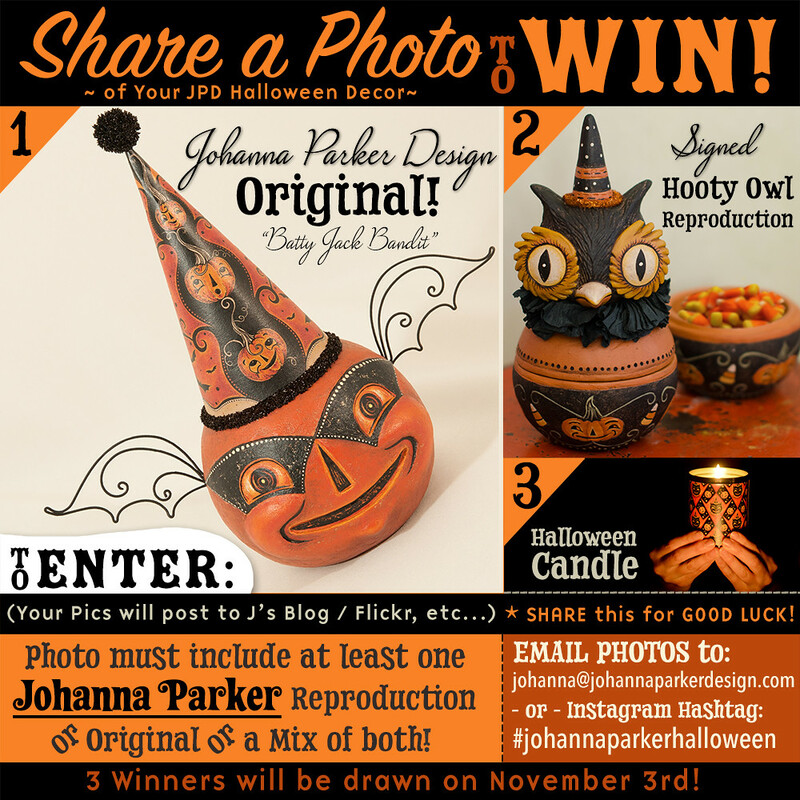 J: How long have you been collecting my Halloween originals? J: I do have a tendency to hang on to emails, and it's fun to go back and watch a relationship bloom! I'm so happy that you reached out to me! 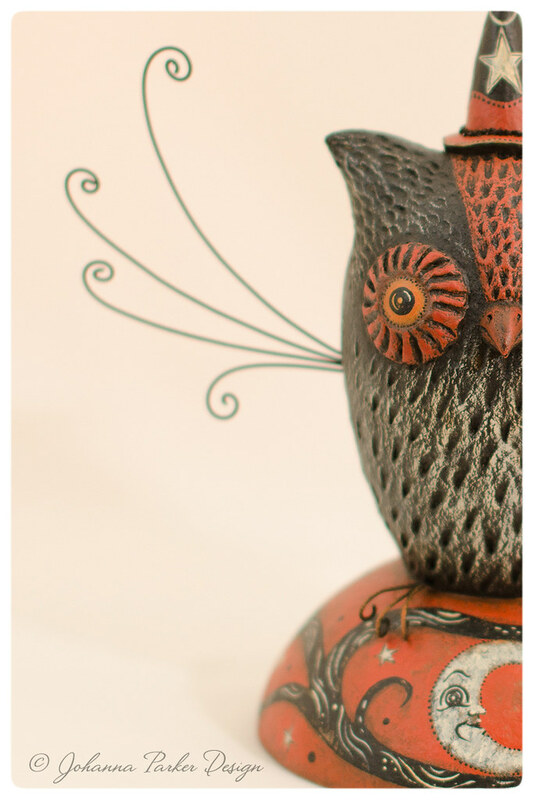 * What a lovely corner this is for a pair of my original owls to call home! 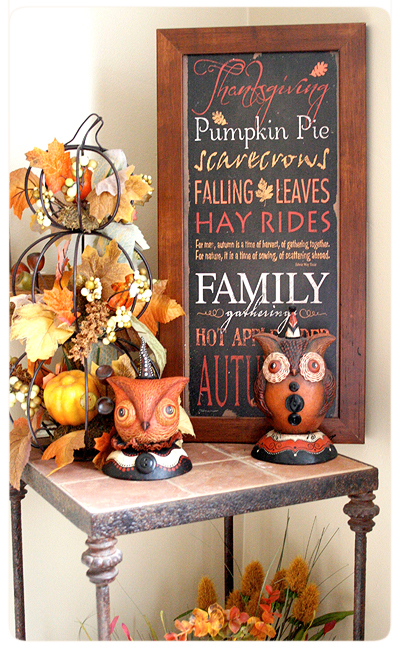 The warm fall hues of these feathered friends compliment the nostalgic framed typographic art. And Martha's autumn-inspired arrangements add a lovely texture and softness to this scene. Just beautiful! 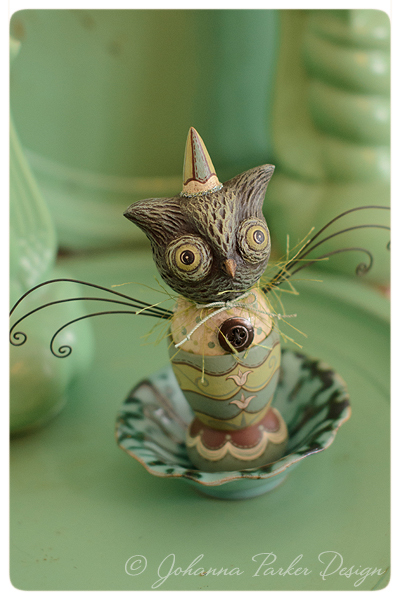 One of a kind owls by me at Johanna Parker Design. 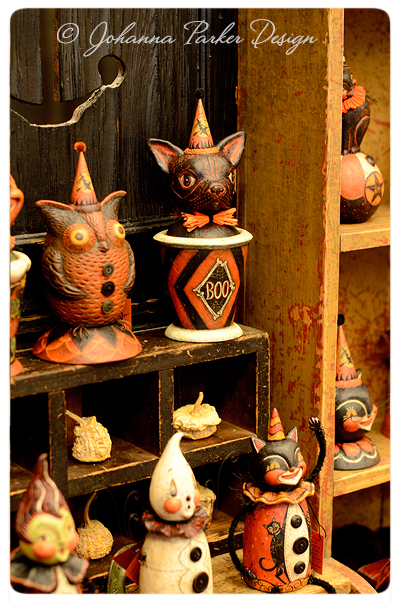 * High up in a nook, we see a yummy Halloween scene in rich hues of orange and black! 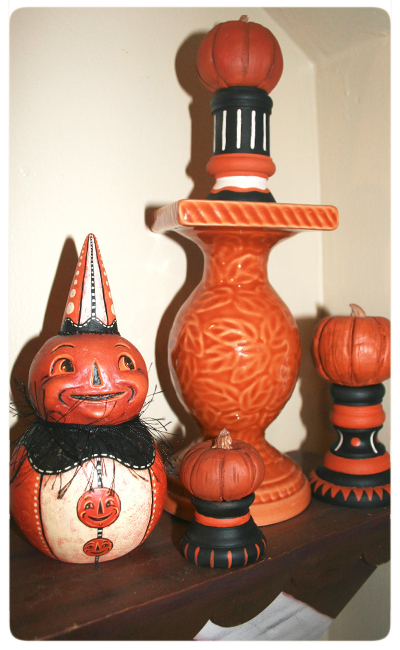 My Jack ball character glances up to a candlestick pumpkin by Ginny Diezel. A pretty ceramic pedestal ties the group together ever so nicely. 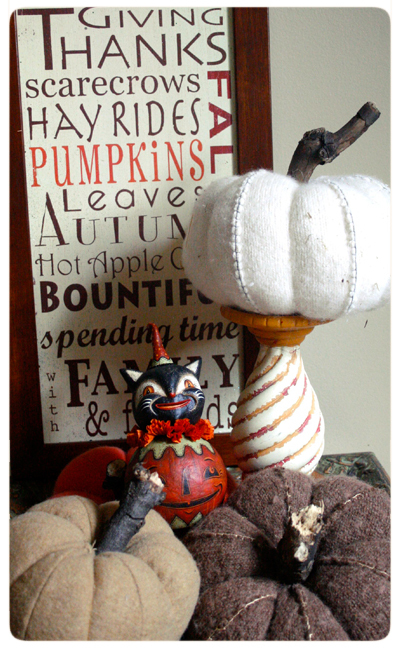 * Nestled amongst a collection of fabric pumpkins by Willow Creek Sparrow, one of my cat ball characters grins quite wide. J: What is it about these characters that captures your imagination? J: Well thank you for the sweet sentiment. I make pieces in a style and feel that I would be drawn too if I were hunting for treasures. I am happy to be able to capture that vintage charm and release that joy through my artistry. 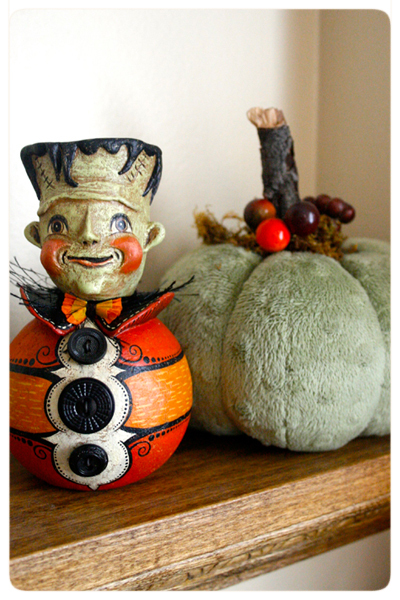 * Speaking of smiles, this sweet Frankenstien ball character - my first Frank - offers a sweet little smirk. 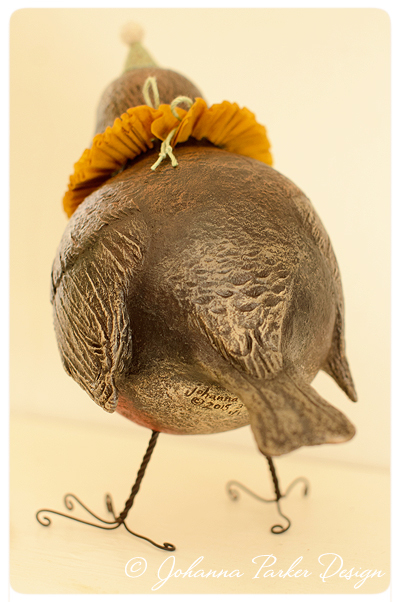 He is carefully paired with a vintage green pumpkin by Willow Creek Sparrow for a lovely color duet. shows, web sales, Collector's Catch, eBay, etc? 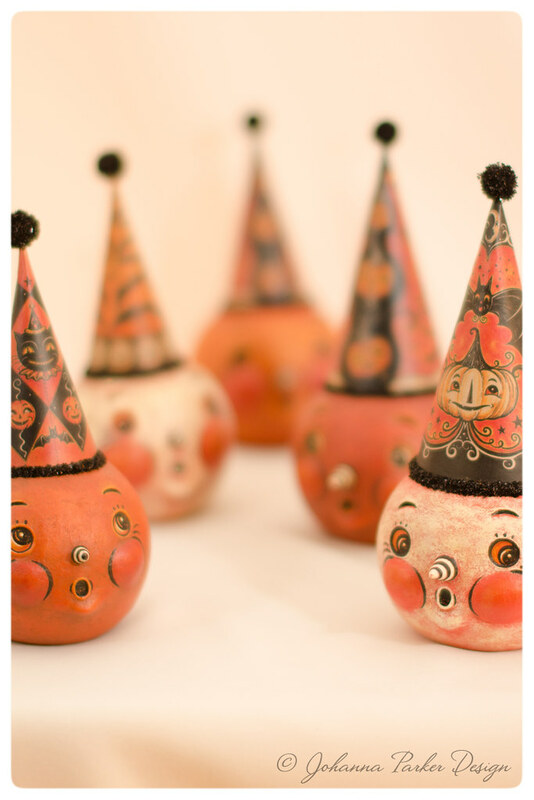 Martha: I have never had the pleasure of going to the Halloween Trunk Show, Halloween and Vine or Ghoultide. But I have gone to your Holiday Open House twice and bought plenty at your home! I have had amazing luck with the Collector Catch! I think I have a Johanna Sixth Sense and get an impulse to check your website! HAHA.....lucky me! I have gotten one piece from your lucky list. I have found some originals as they pop up on Ebay every now and then. And, I am pretty quick and usually grab one at each websale! 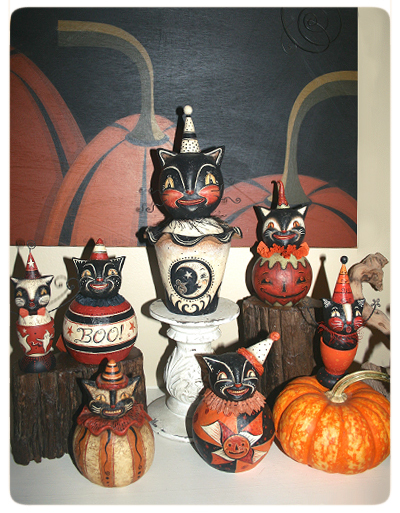 * From Martha's mantel collection of Halloween cats, this close up reveals a trio of cats that date several years back. There is a noticeable difference (I hope) from my more primitively sculpted originals at the start of my career to the more refined work I do current day. It's fun to see the artistic progression. J: Do you have a favorite piece in your Halloween collection? Martha: Hmmm.....gosh I love them all! 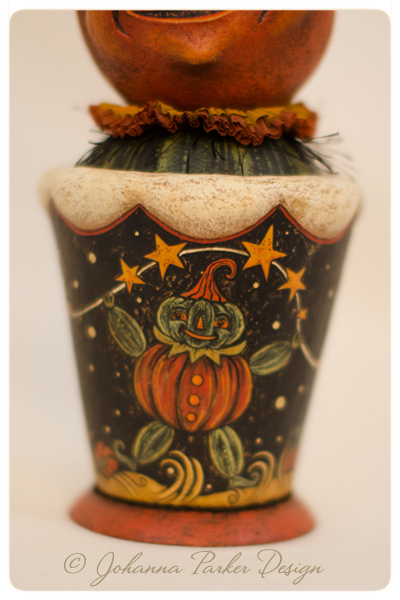 Of my Halloween, one of my fav's is Dolly Crescent....she is the beautiful black and white candy container with the AMAZING moon on it. Not to mention the adorable mouse sitting on the moon. 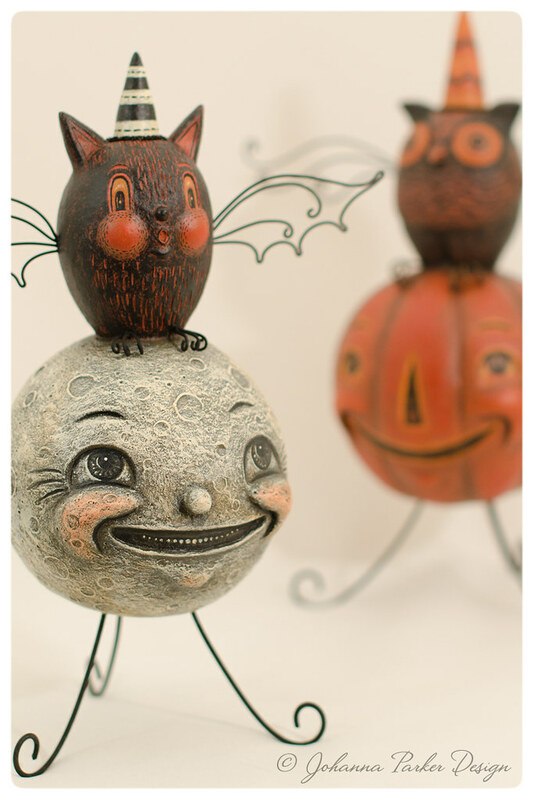 I also especially love two of my shelf sitters: Full Moon Marcus (2008), probably no additional description needed of this moon man, and Vinny Vine (2012) a super cute JOL sitter with black and creme striped arms and legs! * Here, at center is "Dolly Crescent", one of Martha's faves! Dolly crowns a collection of cats on the mantel. 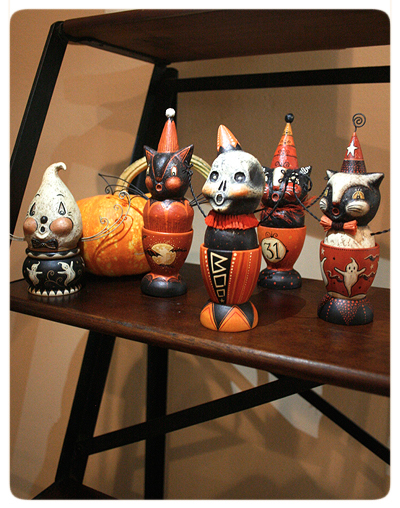 Drift wood risers, a pumpkin and a candle stand, all act as clever perches for these fun folk art characters. 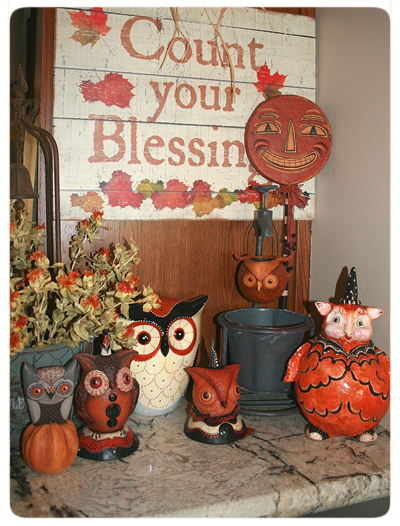 A painting of pumpkins by Carrie Huber of 40th and Plum, makes for a bold, graphic backdrop. * At left along the mantel sits "Full Moon Marcus"once again. 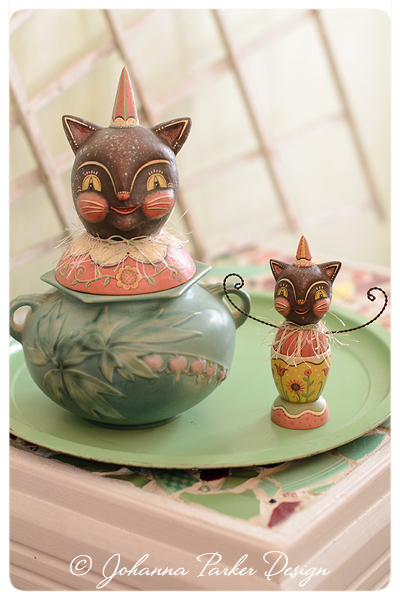 Another favorite find of Martha's, he sits with a companion carnival-style cat, both one of a kind sitters that I sculpted. I love the lantern style cabinet as both a display case and as an architectural backdrop for the scene. * And then there's "Vinny Vine," another favorite from Martha's collection. 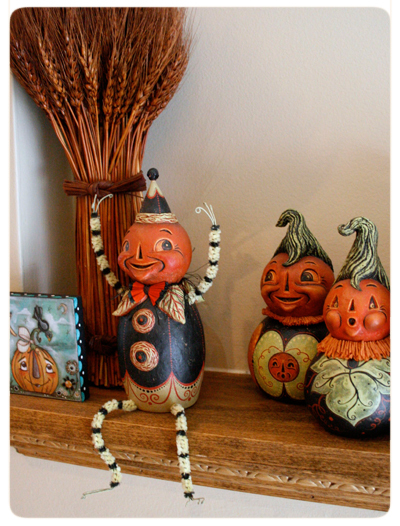 Gathered in a nook with two of my ball character JOLs and a sweet jack-o'-lantern painting by Diane Duda, they all offer harvest cheer! J: Is there anything in particular you suggest I try making in the future? Martha: Loved that I had said reindeer at some point and you did! Love that I said elves, as I know others did too, and you did! And that I got the first ones of those!!! Hmmmm.....I would love a Christmas Skunk! They were my fav animals growing up and I think the black and white would be cute! Also a huge chipmunk fan.....love the stripes! Oh, and foxes are awesome too! Additionally now you did foxes!!! 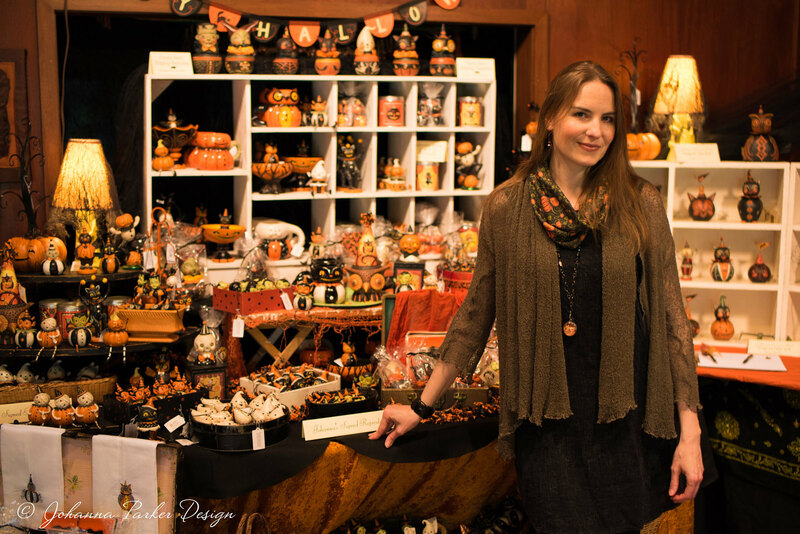 I missed out on those this season as I couldn't make it to your Halloween Trunk Show. So I guess I'm still pushing for a skunk, a chipmunk, and now how about a white fox for Christmas!!! J: Hey, that's good news that I am listening to my collectors. I know I haven't attempted a try at all the various suggestions that I receive, but I do like a good challenge! And when time and mood permit, I will give it a go. Yes, skunks, chipmunks and white foxes would be sweet!…. 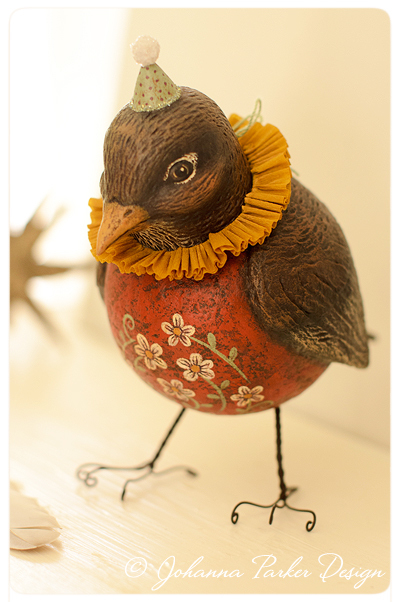 In following, I will share a few more arrangement ideas from Martha's lovely home. You will spy some of my previous pieces making appearances in new arrangements along with the clever works of fellow artist friends…. 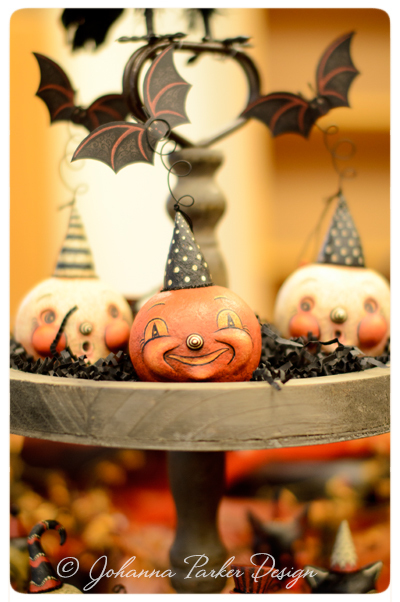 * It's a pumpkin patch, and props are certainly key to great composition. 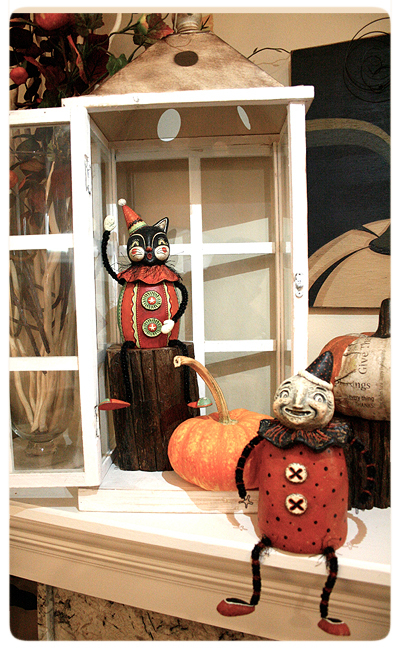 Here, Martha uses a vintage style cubby to display a line-up of my jack-o'-lantern ball characters below, while a sweet jack by Mandy Broome of Fiddlestix Studios perches above. A cart carrying a lumina Jack by Nancy Malay, tucks under a bundle of wheat. And, I spy my "Vinny Vine" sitter again, resting on the edge. 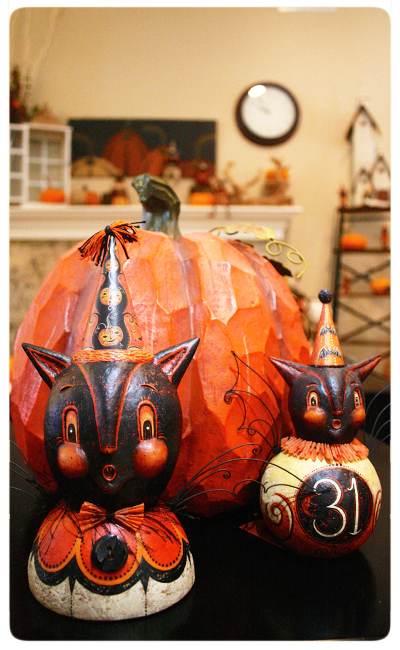 * These arched nooks in Martha's home are the perfect stage for a Halloween scene. 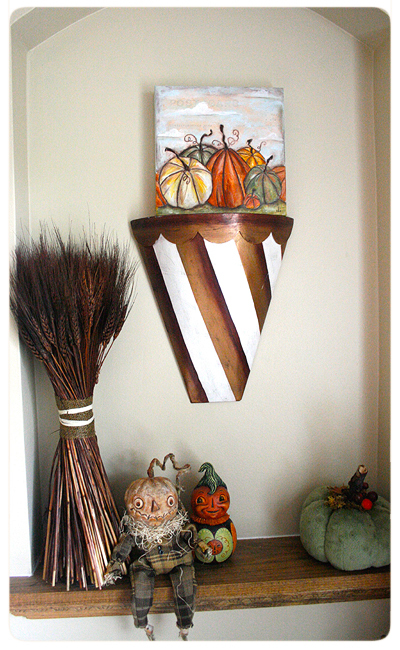 Above, a pumpkin painting by Diane Duda adds color and a harvest motif. 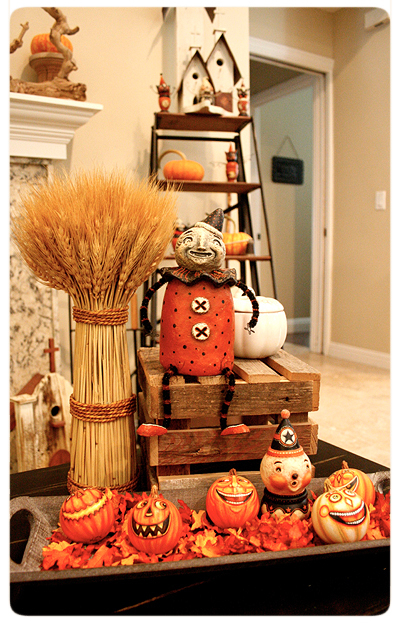 Below, a sweet jack scarecrow by Melissa Valeriote rests next to one of my JOL ball characters. * OH Bats! 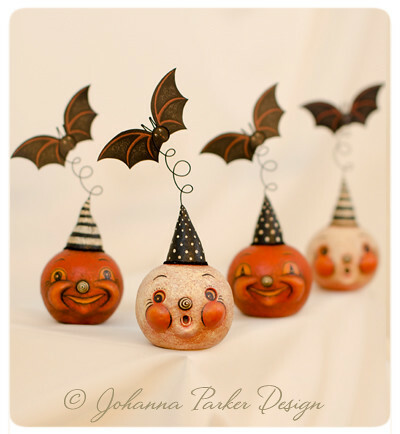 These two bat originals by Johanna Parker Design get cozy with a carved pumpkin. And…..Count your Blessings the sign says! I hope you enjoyed the tour of Martha's home for Halloween! I know I did! What a pleasure it is for me to see my handmade art and the wonderful creations of fellow artists living in harmony and all so lovingly arranged. Many thanks to Martha for opening her doors to us and inspiring many during this special season. I am honored to be a part of this lovely home. To leave a message for Martha or myself, please click on the "comments" link at the bottom of this post. Thank you! Mixing it up with Red, White & Blue! Hello friends! 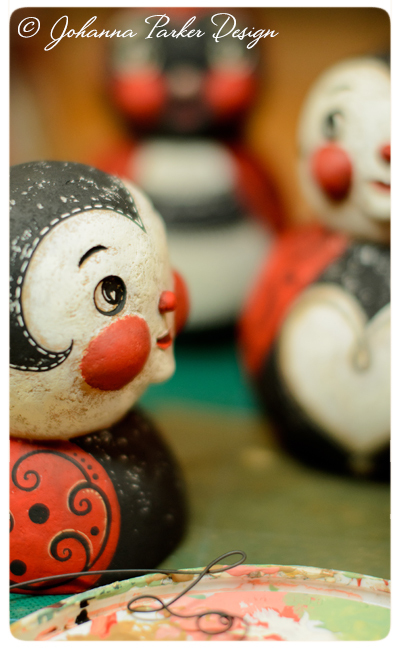 I know it has been far too long since I have blogged. I miss writing and sharing photos of my work, and I miss having the extra time to do so. Thus far, this year has been a busy one, brimming with creative projects, family visits and volunteering for the community. I told JP that we really needed to snap a few quick pics in the workshop just to reassure folks afar that we are still alive and creating! So, today, JP captured a few photos while I added the final layers of papier mache patch to my in-progress collection of patriotic characters. 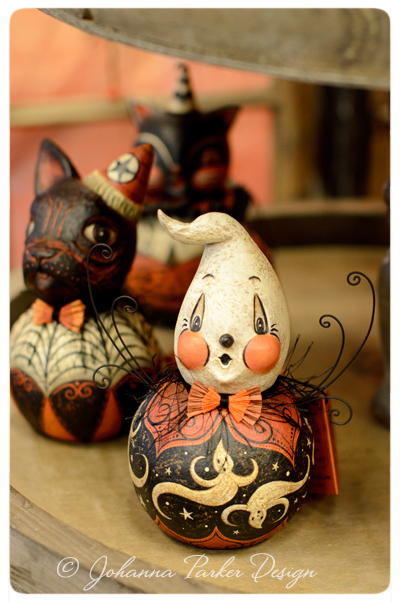 The Americana-themed subject matter is a rare genre for me as I often jump directly from spring to Halloween. But, the requests from collectors to make a few red, white a blue guys have begun to echo more and more. So, I set the orange and black paints aside for a palette more reminiscent of 4th of July! 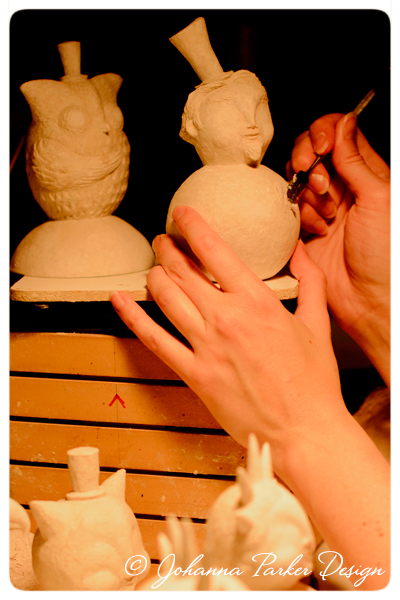 I look forward to painting these pieces soon and watching them come to life! Currently, I have nine pieces in the works. The plan is to host an Americana Web Sale in mid to late June. So, stay tuned for more information to come! And Join my Mailing List if you have not done so. Enjoy the photos, and thank you for taking the time to visit my blog! Wishing you a Happy Summer! * More patching was also necessary for an Uncle Sam ball character underway. 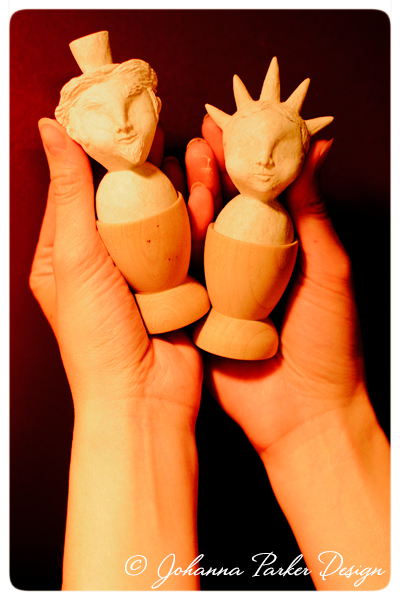 As I do not use underlying forms, manufactured spheres, etc… to build my pieces, each has a hand formed feel. I do try my best to even out the ball characters to balance their appearance. 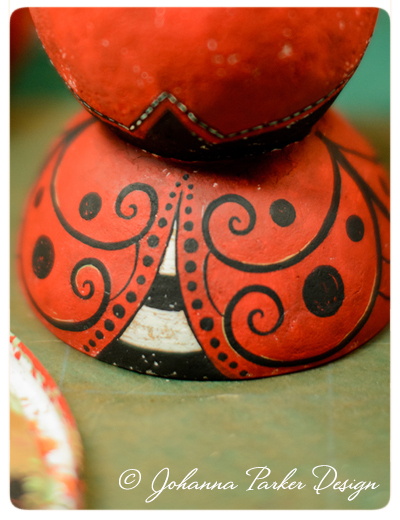 Some may notice that my folk art is organic in form. 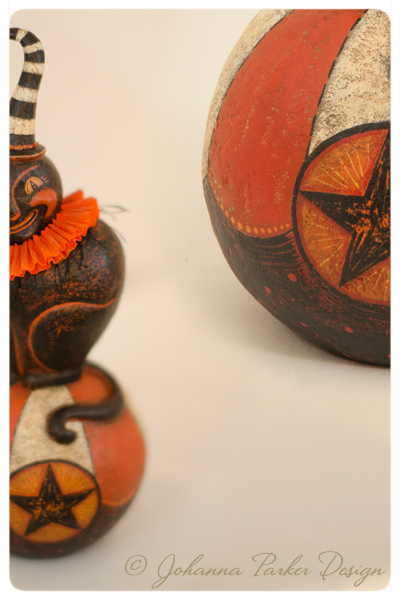 * Here is a sneak peek at pair of patriotic egg cup characters. 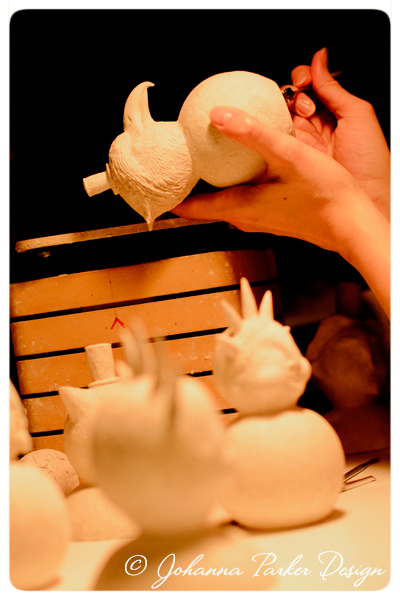 JP just finished sanding these little guys, and they have been yearning for paint! * And of course, Americana art is not complete without a bald eagle! To keep in touch with my progress, make sure to follow me on Facebook and Instagram…. 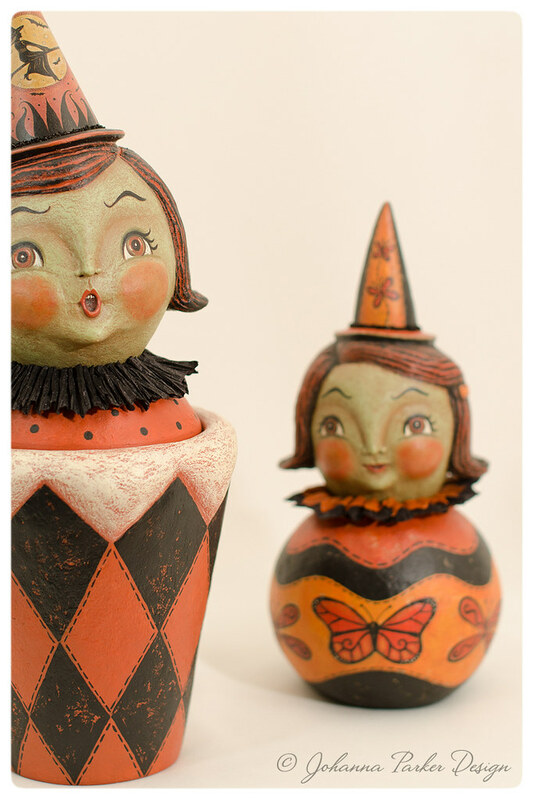 My spontaneous Spring Folk Art sale debuted this evening, only via my e-Newsletter, and I want to offer my THANKS to all of you that adopted a collectible original. I know some of you were anxiously awaiting for the sale to start with eyes peeled on the 'ol inbox! Thank you for your perseverance and your patience. I wish I had made more pieces to go around, but I appreciate the interest of so many art-loving friends hoping to acquire a special piece! For those of you that missed this sale, you can peek at my "Spring it On" Newsletter for links to more photos of each piece. Prior to the sale, I snuck a few artsy photos of these blooming delights. So, Enjoy! Hello friends and Happy 2014! I just realized that it has been a whole month since my last post! 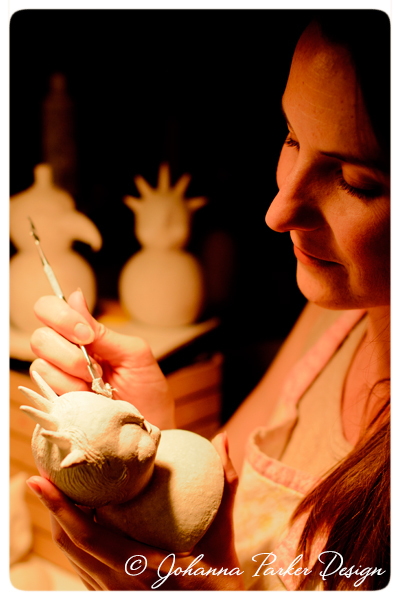 After the holidays, I took a little time off from blogging as well as sculpting. The break was a nice change of pace after a very busy show season, but I am happy to be back and immersed in my creative bliss! Currently, with Valentine's Day just around the corner, I am working on a handful of original LoveBugs. I snapped a few photos from the work shop, but remember, they are not quite finished yet... They still await more painted details, wire accents, buttons and trims. With just a few of these one of a kinds to offer, I have decided to release them within my next Newsletter which will go out in early February. As it is a spontaneous sale, there is no scheduled sale date. But, it looks like I will have about a week or so to finish this small collection of ladybug inspired characters, photograph and prepare their graphics. 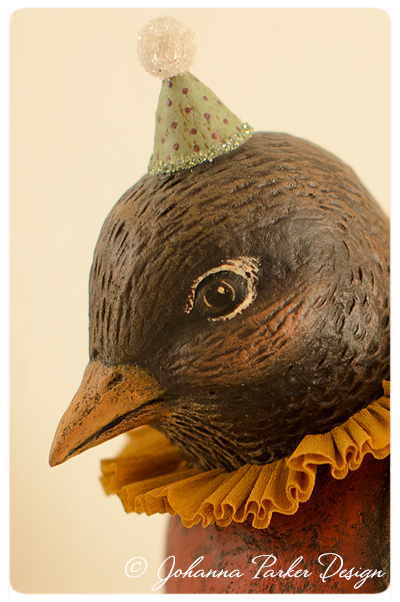 So, keep an eye on your inbox, and best wishes to you for a LOVELY new year! * A peek at the back side of one of my LoveBugs reveals swirling patterns and spots!